Take 'em off. It's the decent thing to do. Snow comes with its own set of chores and activities -- and social obligations. Manners, you might say. What are they? What rules should we all live by in the winter? Last year we considered the ethics of the shoveled parking spot. But there are plenty of other ways to be a force for good -- or not -- when the snow start to fall. Toward that end, we've put together a few guidelines for Capital Region winter etiquette. Because good manners help everyone have a better day, no matter what the weather does. The rules, after the jump. And we'd love to hear your suggestions. 1. When you're brushing off your car, don't leave a thick cap of snow on the roof. Sure, it doesn't affect your visibility, but once you're on the road it'll blow all over the windshield of the car behind you. 2. Shovel your walk. Don't shovel just what you need to get out of your own house. 3. If you have a corner lot: Shovel a path to connect your sidewalk to the street. Someone needs to cut through the ridge of snow left by the plow truck, so it might as well be you. A block's worth of clean sidewalks are useless if people can't enter or exit the block. 4. Snowblowing? At 7 in the morning? On the weekend? Really? 5. When you're shoveling out your car on the street, don't dump the snow where it buries your neighbor's car more deeply. 6. You've entered someone's home in boots caked with snow and salt. Leave your footwear at the door. 7. Knocking down snowmen is just mean. 8. When you're walking with your dog at the park, the golf course or another mixed-use area, don't walk in the ruts cut by cross-country skiers. 9. And speaking of dogs, the guidelines of the dog poop flow chart still apply. There's just no camouflage for those "deposits" in the snow. 10. Do you have an elderly neighbor? Help them shovel. It's the right thing to do. Agree with these? Disagree? We'd love to hear your thoughts -- and suggestions. Hear hear to #8. Snowshoers and snowmobilers should also avoid the parallel tracks. #1 especially for SUV owners. I realize it's hard to reach the roof your hulking ode to conspicuous consumption, but it's an SUV. You have the space to fit a broom or something in there. And if you don't, you should probably reconsider the life choices that brought you to that point. I hear you on so many of these! If you plan on using any sort of rock salt or icemelt on your walkway or stairs, make sure that if you or your neighbor has outdoor pets, that the icemelt you use won't cause any burning on their paws if they walk through it. #11 When you plow out your driveway, don't plow the contents into the street. It does not simply "melt" out in the road. It creates a driving hazard. #12 If you're driving a plow truck, always check behind you, not just with your mirrors, before you back up. And never back up into a street without looking. I realize you've got 10 more driveways to plow, but taking an extra second to look might save an accident or a life. Some fine, common-courtesy reminders in there. For those folks who work the weekend, waiting for a more genteel hour to accommodate their hangover-nursing neighbors who decided, as the first few flakes started to fall, "Woooo! Snooooow! I'm not going out tomorrowwwwwww," such consideration is not always an option. Jus' sayin'. -"help" your elderly neighbor shovel? how 'bout just shoveling FOR them?! -also, thou shall snowblow the end of your neighbor's driveway while doing your own if plows have come by since the driveway was last cleared. If you own a truck with a plow on the front, be nice and plow away the plow ridge at the end of your neighbors driveway (I'm not suggesting the whole thing), especially if you see them trying to shovel it away. It's one swipe and takes less than a minute and makes you the most wonderful neighbor ever. Good list. I hadn't thought of #8, but it makes sense. Also, learn to share the sidewalk. People only tend to shovel a tiny strip of walkway, and a huge pet peeve of mine is when people walk straight down the middle instead of moving over, forcing me to walk through a snow bank or wait for them to pass me. Serious cautionary tale on #1: When I was younger, I was driving my parents' old minivan (because that's how I rolled). I wasn't able to clean off the roof (OK, I probably could have, but I just DIDN'T, all right?). While driving up I-87, a big chunk of rooftop ice broke off and hit a truck behind me, cracking the trucks' windshield. I didn't even realize it had happened until that night when I received a call from a NYS trooper confirming that I'd been on the Thruway that day. The trucker, thank god, was fine and had glass coverage, but I did have to fill out some paperwork. I can only imagine what might've happened had my roof ice hit a smaller car or caused someone to swerve off the road. Lesson learned: now I have a little car with a low roof that my tiny arms can reach, and I ALWAYS clean off my car completely. Is it just in Albany that people don't tend to shovel their sidewalks? There is a fine for not clearing it but it seems as though few people care. Agree with all of these except #4. People can snowblow whenever they want, as long as they do it. It's annoying enough to find time to clear snow as it is and I don't think it's right to tell people when they can and can't, especially when you don't know their work schedule. I would add one other - Do Not Walk In The Street. Where I live, so many people will walk in the middle of the street if they think not everyone has shoveled. 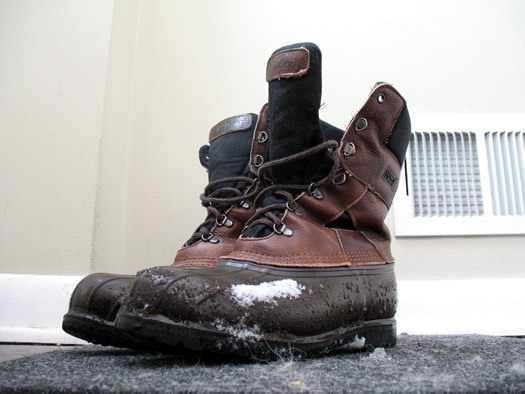 If you're worried about a little snow on your shoes, then you need different footwear. Walking in the street is always a bad idea; it's even more dangerous in snowy conditions. #12 clean your car off BEFORE you move it to a cleared spot, not after even if it means you have to work a little harder to reach the snow. Rob, not everyone can afford big snowboots and if you have diabetes you have to be especially careful about your feet getting chilled from melted snow in your shoes/crappy boots. Also, some people, especially the elderly, cannot keep their balance on snowy/icy sidewalks, so they have to risk the street and in my case, sometimes the only way to get around to the library or store for me during the day when husband has to take the car in to work after a snow is to take the toddler out in the stroller and if someone hasn't shoveled their entire sidewalk (my neighbors on the corner) than i cannot get the stroller through. My 22 month old is too little to walk the whole way and there and back and i cannot carry her and the groceries back at the same time, so yeah, you might see some folks walking in the street--i hope they are all as super careful as i am b/c it is pretty dicey out there with all those texting drivers. I really dont think I can agree with the not snowblowing at 7am. If i gotta go to work at 6, and be up at 3 or 4 to snowblow ....guess what? I'm snowblowing in the wee hours! And if my neighbor want to snowblow or shovel and keep the sidewalks cleam, more power to him! I listen to the plows waking me up in the middle of the night as they go down our road.....its all part of winter and living in the Northeast...so live with it!! the older a female is the less likelihood there is for a man walking by to offer help. first i used a cane, now a walker. we now have to hire someone to shovel. the final straw came when i slipped under the family car. Please don't snowblow into the street or at your neighbors houses. When coming to a stop sign or turning a corner, remember these areas are especially slippery. Then tend to ice over quickly. Give us slower polks a break when we slow down well in advance to either stop or take a corner. Don't get on our tail. And, when you are taking corner or stopping at a stop sign...remember you could slide into on oncomming vehicle so slow down! -Make sure to clear a path for your mailman. And really, your neighbors who snowblow at 7:00 a.m. probably don't do it because they enjoy it. Given the choice, I know I'd much rather be snuggled in bed and feeling mildly inconvenienced about being woken up than be clearing my driveway. We do it because we have to go to work. When shoveling out your car, don't dump the snow into the road, especially side streets that aren't plowed as often as main roads. @Julia -- I would imagine that the people in Albany who "don't care" about shoveling their sidewalks are probably renters. The landlord is supposed to provide snow removal but many don't set anything up at all. It's not the tenants responsibility. Some of them may not even be physically capable of shoveling or not in town... landlords need to take more responsibility for their properties. And as for snow blowers -- well, noise ordinances apply. Like anything else that makes a lot of noise, you can't use it during the quiet periods as determined by your town ordinances. Clear the snow away from fire hydrants. I don't know whose responsibility this is officially, but if there is one near your house just do it. I've got one: Don't shove your snow out into the street. Oh how I wish we were discussing lawn mowing etiquette instead. Asking for people to be courteous and clear sidewalks and connecting paths and then telling them when they can go out and clear the snow is pretty selfish. Do your neighbors and firefighters a favor, if you have a snow blower make sure your fire hydrants are cleared out too! Kobe: Good point about the problem with sidewalk clearing in Albany being the neglectful landlords. I think the city tried to crack down a few years ago and fine landlords/homeowners who didn't clear their sidewalks, but maybe the city just gave up. Oops, I was snow blowing at 4:30am after getting in from the fire. My bad. Disagree regarding snowblowing. I don't work weekends so the chances of me pulling that sucker out before 9 are slim to none. If someone IS trying to get to work and needs to plow themselves out, it's ridiculous that you'd expect them to shovel the sh*t because you're napping. Your hours aren't everyone's hours. If you need peace and quiet you should move to the country. Whether you're an owner or renter with a cruddy landlord, if you choose not to shovel you sidewalk, you're a lazy, inconsiderate neighbor. Having spent the last four years as a renter and a pedestrian, I've had to shovel more than a few sidewalks & paths to the dumpsters over the years. Itâ€™s not about principles, itâ€™s about doing the right thing. Coming from the country, I think itâ€™s amusing when Albanians have snow blowers for their short little driveways anyway..
Wow. All good comments and not one mention of equiping your vehicle with snow tires. When you head out onto the roads on your 3 season ("all season") tires, you're endangering yourself and those around you by lengthening your stopping distance, and the ability to steer your way out of collisions. If you have a car. Buy snow tires or all-season tires. I'm sick of pushing people up the hill next to my house, and watching as their tires spin their car dangerously close to mine! @sally I agree 100%. Stop whining, people. Just grab a shovel and do it. "That's the Landlord's Job.... I shouldnt HAVE to shovel, it's not MY sidewalk.... Who walks in the winter anyway...." Grow up and SHOVEL IT. what happened to chivalry? now that i am older not one man has offered to help when i am outside with my walker, and shovel? In Albany you can call the city (Dept. of General Services) to report side walks that aren't cleared. Granted that includes thousands of residences, but if more pedestrians started making those calls, the city would start enforcing the city codes and fine those deadbeats who don't shovel. This is not a walkable city after the first snow fall. We can take some action to make it safer for walking. daleyplanit, maintenance is usually something that is spelled out in a lease. If it's in writing that it's the landlord's responsibility, it's kind of sucky to complain about the tenants when a sidewalk isn't cleared. Yes, of course they should do it if the landlord is lazy, but that kind of sets a precedent, no? What if you live in a ten-unit building and your neighboring tenants won't do it either? Why should it then fall upon you? It's not about growing up, it's about standing up for your rights. Yes, I realize it sounds silly to suggest someone has a right not to shovel a sidewalk, but it's really about absentee landlords assuming the responsibilities THEY ARE PAID FOR. Insulting tenants for not doing a job they are paying someone else to do is pretty crappy overall. @B I understand you. But there are several properties in my neck of the woods where sidewalks aren't shoveled. All of them are mult-unit buildings. While the tenants and Landlords are fighting over who's job it is to clear the sidewalk, I'm the one trudging, slipping, and falling on my face. Sometimes you have to put down the protesting and pick up a shovel. Sure glad I live in the country and don't have a sidewalk. I hear you, daleyplanet. But when it comes down to it, the tenants have just as much responsibility to clear the sidewalk as you do, so why not pick up a shovel yourself if you're going to bark at them? It is your neck of the woods, after all. How about a tip for having a shovel or snow brush for the ladies out there. Over these past few snows I've helped several fellow-females shovel out their car. Same scenario every time: Girl comes out of apartment dressed up with somewhere to go (ie: Heels, nice coat, little clutch) and does this strange prance around their car expecting the snow to blow away or magically melt by looking at it. If it snows; don't come out to your car expecting it to be cleaned off, or accessible. Allow a few extra minutes (or 45) to clean off and shovel your car off. I don't mind helping, but it pains me to see other ladies as clueless and incapable as the ones I've come across. The number one rule of politics is picking the right battles. Fighting against lazy landlords on the terrain of "snow shoveling" is not a strategic move. 1) When I shovel my car, take a moment to shovel a bit of the adjacent sidewalk. It's not much, but imagine if one in five people did that. 2) Think long and hard about the landlord/tenant situation in Albany. I get the impression there may need to be some activism, or creative solutions, or maybe even policy changes. But I'm still new here, and learning the terrain of Albany's city-wide challenges. Thanks for the awesome list, AOA! Super informative for a sunny state transplant. Ever since I first came to Albany back in the late 1980s, I have been dumbfounded with the state of Albany's sidewalks in the winter. I wondered how this community could have such disregard for the needs of those who use the sidewalks. A year ago, I introduced a piece of legislation that would change Albany's snow shoveling ordinance. I did this to start a conversation about the problem, not necessarily because I think the provisions of the ordinance (lifted from Rochester and Buffalo) were the answer to our slippery sidewalks. On Jan. 14, Chrisck said, "In Albany you can call the city (Dept. of General Services) to report side walks that aren't cleared. Granted that includes thousands of residences, but if more pedestrians started making those calls, the city would start enforcing the city codes and fine those deadbeats who don't shovel. This is not a walkable city after the first snow fall. We can take some action to make it safer for walking." I spent some time last week talking with the hard-working folks at DGS about this issue, and unfortunately, I don't think that more folks calling DGS is going to get properties cleared any quicker -- though at this point, it is exactly what you need to do to try to get that property cleared of snow and ice. One thing you can do if you share my concern about Albany's sidewalks in winter is attend tonight's Law Committee meeting where they will be taking up two separate pieces of legislation related to shoveling. 5:30 p.m. - City Hall - 2nd Floor Court Room. Bring your ideas about how we can have a more walkable city in winter, or just come to listen.